When a loved one suffers with dementia, it is devastating for their family. The most worrying aspect is whether they are safe and secure in every-day life. We provide a warm and friendly environment, while also enriching the lives of our residents. We are proud to give the best dementia care Hampshire-based residents can rely on. Contact our team at Barton Lodge on 01425 617111 or Woodley Grange on 01794 523100. There are not many things more terrifying than losing the ability to know your surroundings and faces around you. To make life safer and easier, we specialise in looking after residents with dementia. If you are researching rest homes on behalf of a family member in Hampshire, dementia care is something that we have vast knowledge and experience in. All of our carers have had specialist training, so when it comes to a resident needs, we know what to do. We endeavour to make each and every one of our residents comfortable during their time with us. It is important to encourage independence in dementia care. Hampshire-based residents will have the full use of all of our facilities. We know how much stress it can put on family members seeing their loved ones struggle with dementia. Care in Hampshire can be difficult to come by making us an invaluable choice to have. We have studied the best dementia care homes around the globe, so you can feel comfortable knowing that we have our residents’ needs at the forefront of our minds. In this day and age, care services can be stretched and sometimes there is not enough staff on hand to help. This is something that you do not have to worry about with us. Based in Hampshire, dementia care in our homes exceeds industry norms with regards to the number of dedicated staff that we have. More and more we hear this term, but not everyone is clued up on the meaning of it. Dementia refers to illnesses that affect the brain, in particular, memory. Alzheimer’s disease is the most commonly known form of dementia. To pick up signs of the disease, you should be aware that early onset will involve a person becoming forgetful. During our extensive years of dementia care, Hampshire residents that we have cared for have suffered significant memory loss. There may be occasions when someone cannot remember the names of their family members. Also, at one point they may forget how to do normal tasks, such as cooking. 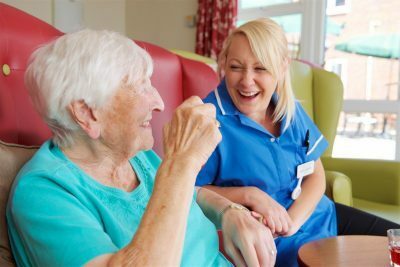 Why Choose Us For Hampshire Dementia Care? When it comes to something as serious as looking for care services on behalf of a loved one, you need to make sure you choose the right place. Our philosophy is “loving care matters”. We are a family-run business that has spent years learning how to provide the best dementia care. Hampshire is the area that we are based in and our aim is to enrich the lives of our residents. Having dementia does not mean that the world stops, so we have plenty of activities for our residents to get involved in. We believe that it is important to give our residents an enjoyable lifestyle and we ensure that we maintain their dignity. For those in dementia care, Hampshire is a beautiful place to reside, so they have the added bonus of taking in our surroundings. We offer different levels of care, from long-term to short-term and day care. Depending on the needs of the individual, they will receive first-class dementia care. Hampshire is the base of our two excellent homes that are run by two directors who have 40 years of experience combined. If you are looking for dementia care, Hampshire-based Manucourt Ltd has two beautiful homes run by experts in this field. There is nothing worse than seeing someone you love struggle in their later years, but at our homes, they can still enjoy their lives. We are a devoted business who only provide the best. Please call Barton Lodge on 01425 617111 or Woodley Grange on 01794 523100.